PALO ALTO, CA--(Marketwired - Nov 12, 2013) - Bill.com, the leader in integrated bill payment, invoicing and cash flow management solutions for businesses, today announced that it has closed $38 million in financing. Led by new investor Scale Venture Partners (ScaleVP), the round also included participation from Bank of America, American Express, Fifth Third Bank, Pete Kight, founder of CheckFree, and Commerce Ventures, as well as all of Bill.com's previous investors -- August Capital, Napier Park Global Capital, TTV Capital, Jafco Ventures, Emergence Capital and DCM. As part of the investment, Rory O'Driscoll, a partner with ScaleVP, has joined the Bill.com Board of Directors. With this funding, Bill.com has raised $80 million to date. The funds will be used for further investment in the Bill.com Banking Platform to support its rapidly growing banking channel; acceleration of the Bill.com Business Payments Network, which serves all of Bill.com's subscribers and its partners; customer acquisition; and investment in the core product features and integration with third-party applications to better serve small to medium businesses (SMBs), accountants and bookkeepers. "We like to invest in companies that take complex problems and make them easy. Bill.com takes the ease of use of consumer online bill pay solutions and adds enterprise features like workflow, access control and approval processes," said Rory O'Driscoll, partner, Scale Venture Partners. "Customers who use the product rave about it. It allows them to get a direct handle on cash, which is the lifeblood of any business." Bill.com is the fastest growing business payments network in the nation, enabling more than 275,000 users to pay and get paid. 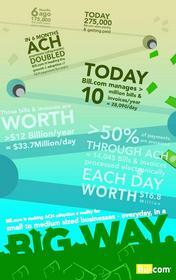 Bill.com manages more than 10 million bills per year, worth more than $12 billion, by combining payments, workflow and document management, and integrating accounting solutions in a way never before done. In addition, the company is converting more than 50 percent of customer payments from check to ACH, meaning Bill.com is the only company making ACH -- commonly known as ePayments -- adoption a reality for SMBs. "Knowing that businesses have lagged consumers in online payments by a significant margin, I have always been excited about how Bill.com is revolutionizing how businesses pay and get paid," said Pete Kight, founder of CheckFree. "As Bill.com has developed its bank platform, I have become convinced that their solution is a game changer for banks. I am excited to help Bill.com become even more successful." "Bill.com has created a platform that allows buyers and sellers to transact more efficiently and cost effectively," said Harshul Sanghi, managing partner, American Express Ventures. "As more and more SMBs begin to transition their operations online, we believe the company is well positioned to be a significant partner to their customers in managing their business on a daily basis." The Bill.com Banking Platform is the only solution that puts banks at the center of their customers' businesses. Bill.com allows banks to integrate the Bill.com solution with their own platform, empowering banks to own the entire cash flow management process -- from payables to receivables to cash flow visualization. Bill.com makes banks the focal point of all their customers' transactions, letting banks monetize the full cash management process while solving a significant pain point for SMBs by finally automating and connecting all of their financial processes. "I started Bill.com because, as a CEO, I felt the pain of managing cash flow," said René Lacerte, founder and CEO, Bill.com. "I am extremely proud that we have automated this manual process for businesses large and small all over the U.S. The financial support of such leading firms as ScaleVP and our strategic investors is exhilarating and motivating. This capital will allow us to continue to expand the Bill.com Business Payments Network, changing the way businesses do business everywhere." Scale Venture Partners (ScaleVP) invests in early-in-revenue technology companies in the SaaS, Cloud, Mobile and Internet sectors. ScaleVP's passion and expertise is in helping entrepreneurs scale their business and grow into long-term companies that matter. ScaleVP has $1B in assets under management and is investing its fourth fund. Representative investments include: Box, BrightRoll, Datastax, DocuSign, Everyday Health, ExactTarget, HubSpot, Omniture, RingCentral and Vitrue. ScaleVP is located in Foster City, California and invests nationwide. For more information, visit www.scalevp.com or follow us on Twitter at @scalevp or LinkedIn at www.linkedin.com/company/scale-venture-partners. Bill.com is the home of the fastest-growing business payments network in the nation, enabling 275,000 users to pay and get paid millions of bills worth billions of dollars. The Bill.com Business Payments Network™ brings small-to-medium businesses simple online bill payment, custom invoicing services, unlimited document storage, workflow collaboration, and the ability to access their back office from anywhere via any mobile device. Bill.com's services easily sync to users' accounting software and online bank accounts to better control company financials while also guarding against errors and offering enterprise-class fraud protection that current methods cannot match. Bill.com serves customers through its direct, accountant and bank channels, bringing together people, systems and documents to redefine how business payments are made. The Bill.com Business Payments Network's growth demonstrates small to medium sized businesses' increasing move to ePayments to save time, money and resources while achieving cash flow precision. Bill.com Founder and CEO Rene Lacerte discusses details of the company's $38M round of financing. Rory O'Driscoll, Partner, Scale Venture Partners Explains Why His Company Is Investing in Bill.com.